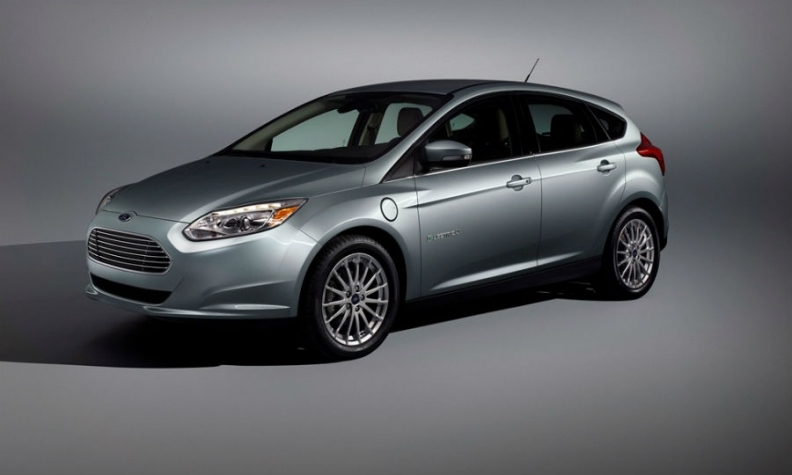 Londoners will be able to hire the Ford Focus EV, shown, in a car-sharing program. LONDON -- Ford Motor is offering electric cars for short-term hire as it expands its car-sharing projects to the UK. The company, which has car-sharing programs in the U.S. and Germany, is offering London residents access to a network of cars to drive for one-way journeys throughout the city. Half of the 50 vehicles used in the London scheme, called GoDrive, will be battery powered versions of the Focus compact car. The other half will be gasoline powered Fiesta subcompacts. Ford aims to gain 2,000 customers for the program by September. “People are becoming increasingly open to new means of mobility, and car sharing is proving to be an appealing model,” Ken Washington, Ford’s head of research and advanced engineering, said in a statement. Ford’s UK scheme is the automaker’s first program that mimics existing commercial schemes such as ZipCar. In Germany, the Ford Carsharing program, now two years old, is run through dealerships. It recently expanded to 40 dealers in 67 cities with 135 locations. Ford has a car-share project in the U.S. city of Dearborn where it has its global headquarters. The program allows Ford employees to use company-owned fleet vehicles. The company also plans a shareable shuttle service in New York and London that will offer point-to-point pick-up and drop-off on-demand. Ford joins automakers including BMW and Daimler seeking to tap the growing market for on-demand driving and open up new markets for their models, particularly electric cars. BMW’s DriveNow scheme, which is run with the Sixt rental firm, operates in five German cities, as well as in San Francisco and Seattle in the U.S., Vienna in Austria and in London. DriveNow is adding BMW i3 electric cars to its fleet. Daimler’s Car2go uses electric versions of its Smart city cars in some of its 29 locations in Europe and North America. Car2Go pulled out of the UK last year after it struggled to attract enough customers. Problems included agreeing costs with local authorities to allow the ‘free-floating’ parking that allowed users to drop off shared vehicles where they wanted.